With not a single win on the record, last year’s women’s basketball season was undoubtedly one of the worst in the history of SCC athletics. However, with their victories over Green River earlier this season, the Phins have dragged themselves up to sixth place out of eight in Washington’s north region of the Northwest Athletic Conference. This is the midseason analysis. It covers what’s changed from last year: what the Phins are doing well and what they could be doing better. The Phins made a major improvement on their offense this season. The Phins’ field goal percentage increased from 27% last year to 33% this season and the team is now averaging 57.67 points per game, which is 16.53 points more than last year. 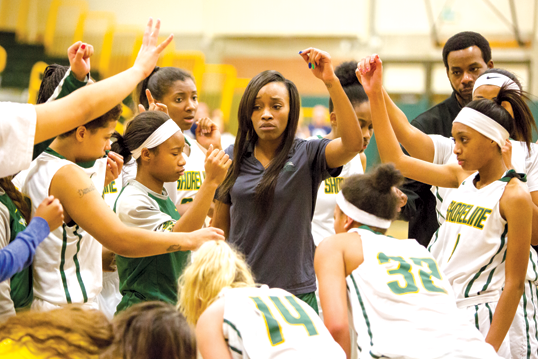 “Offensively, we do good with our in and out,” said Janaya Williams, the Phins Point Guard. She said one of the team’s major offensive strategies is to get the ball into the post, and let the post player pass it out to collapse the opponent’s defense. This strategy relies heavily on the post players and Williams thinks Paris Sanders, the Phins’ forward, played an amazing role on helping with the execution. Williams thinks the team’s offensive weakness is their playmaking: “Sometimes we don’t run our play all the way through.We would forget we have 24 seconds on the shot clock, we will think that we will have to come down quick and then shoot the basket,” she said. Sanders agrees. She believes the offense has potential, and she likes the plans that are drawn up by the coach, but feels that the team could do a better job of executing them. The two players also said one of the team’s biggest problems is that they aren’t being consistent with their offensive strengths: they could out-rebound the other team one game, then get out-rebounded in the very next game. Head coach Darnellia Russell thinks this comes from not running the plays all the way through. Despite this, Coach Russell is confident in the team’s potential. She also thinks it’s just a matter of time before the Phins figure out how to sharpen their offensive end. The Phins’ are all very talented, but they struggle to put their talent together and work as a team. The team will start to run a play but when they get pressured, they lose it. They end up making a bad pass to the inside which results in a turnover, or the player on the court will start trying to break the defense on their own. Even though they have strong players who can all shoot or drive to attack the rim like Darrien Dolquist-Larson, Enjunay Jones-Lee and Dani Hayes, working individually is not going to get the team very far. They are a young team and with time and experience could improve their pre and in-game mindset, and give them a better understanding of the plays. When they can fully grasp the play, they can make smarter decisions on the court in any situation. “I think we are doing ok defensively,” Coach Russell said. She thinks a lot of players on the team are still trying to adjust to the ramped-up intensity of college basketball and her aggressive defense style. She said the players don’t have to be the best, but they should at least create the defensive habit of keeping their hands up. Overall, Coach Russell thinks the team just needs to be more aggressive on defense. The highlight of the the Phins’ defense is that they never give up their target and their defensive rotation on the court is fluent. They always manage to push the opponent out of the colored area and that’s one of their biggest strengths. However, what Coach Russell said about the weakness of the Phins’ defense – not being aggressive enough – is exactly what caused them to lose game. They need to be more aggressive with their on ball defense by putting their chests up, taking the bump and then blocking the driving lane completely. That’s how you shut down a driver. They also need to work on leaving less room for the opponent to shoot. If the Phins solved those two problems, they would be one of the toughest teams in the league to score on. When the Phins use a 2-3 zone defense, as they did against Bellevue on Saturday, they knew how and when to close the gaps so the opponent could hardly score on the inside. What often costs them the game is when the opponent gets to shoot a lot of mid-range jumpers and 3 pointers without being pressured. One of the biggest flaws of 2-3 zone defense is that it can leave some parts of the perimeter wide open, but if they put more practice in their footwork and make a faster recovery they can put the pressure back to the opponent on the outside. Other than that, I think the Phins defense is alright/quite solid and I hope they can keep up the good work of protecting the inside. Game Average: 14.45 points, 1.73 assists, 4.18 rebounds and 2.36 steals. Dolquist-Larson is the Phins leading scorer and ranked 18 in the NWAC with 2.36 steals per game. She transferred from Skagit Valley College where she played during the 2012-13 season. As one of the only two sophomores on the team, Dolquist-Larson thinks she could act as as the mentor for Freshmen and help them with their confidence. Game Averages: 4.64 points, 0.36 assists, 8.09 rebounds and 1.55 steals. Sanders played high school basketball at Cle Elum-Roslyn high school. She is currently ranked 18 in the NWAC, with 8.09 rebounds per game. She has also played more minutes than any other player on the team this season, and for good reason – she’s the backbone of the Phins’ defense. Aside from grabbing rebounds, she thinks that she can also influence the team in some other ways. Game Averages: 7.6 points, 3 assists, 3.9 rebounds and 1.4 steals. Williams played high school basketball at Renton High School and ranked 19 in the NWAC with 3 assists per game. She played the third most minutes this season for the Phins, just behind Sanders and Dolquist-Larson. For Williams, possessing the ball and doing assists are “absolutely” her priority during the game. Williams said her high school coach described her as a real point guard with her playstyle and she said she wants to do that here. “I want to try and be that person where I execute the play, doing what needs to be done on the court which is giving that good pass, executing the plays right,” Williams said. Coach Russell is excited to coach this brand new roster. A big focus of her coaching style this year is to build the confidence that the team needs.